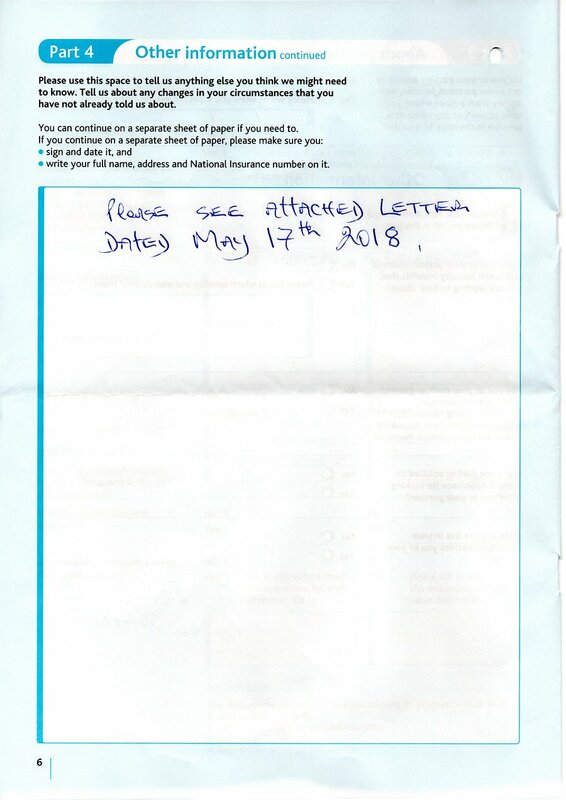 Thank you for your letter dated May 10th 2018. 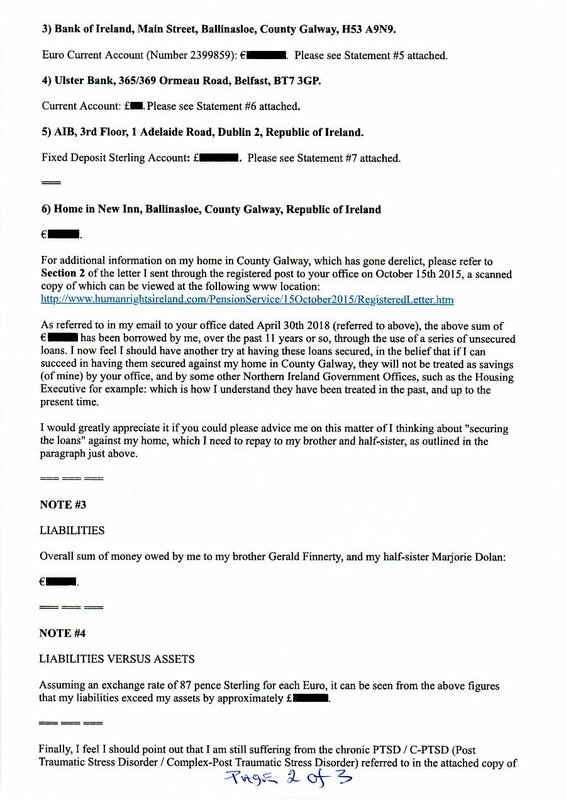 As stated in my April 30th 2018 email at the www location immediately above, I do not in reality have any savings when account is taken of the overall amount of money I now owe to my brother (Gerald Finnerty) and my half-sister (Marjorie Dolan), which I have borrowed from them in a series of loans -- amounting to €90,600 in total -- which were taken out against my home in County Galway, in the Republic of Ireland. 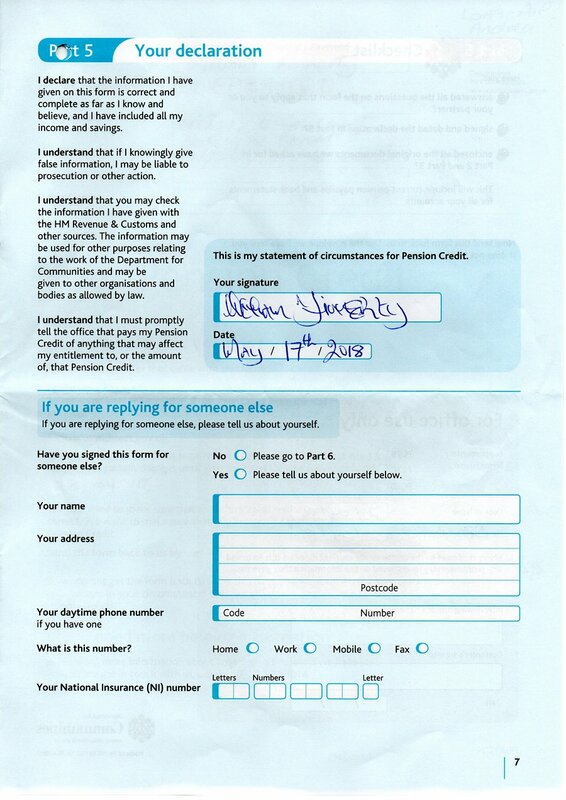 As the period of time in the extension I have been granted in your May 10th letter is not long enough for me to try to have the loans in question secured against my home, I wish to just simply list my assets and my liabilities, as set out below. 1) First Trust Bank, 8 High Street, Omagh, County Tyrone, BT78 1BH. 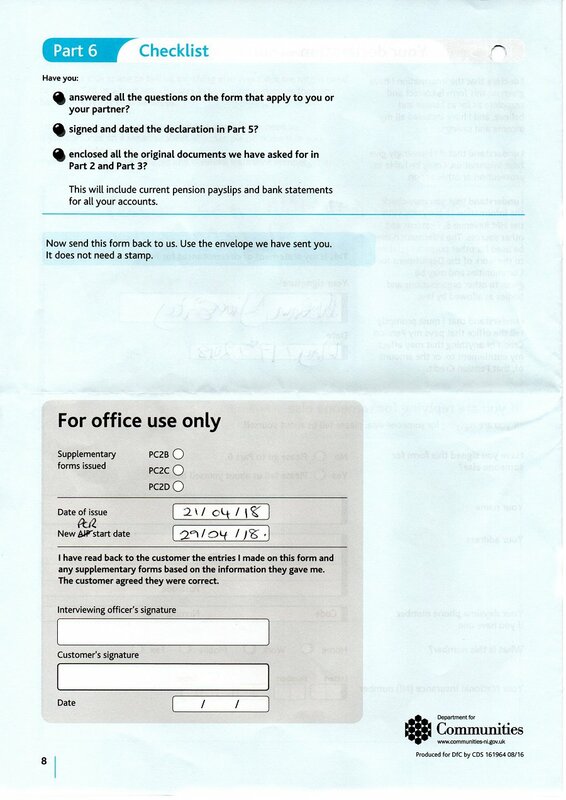 a) Current Account: £*****. Please see Statement #1 attached. 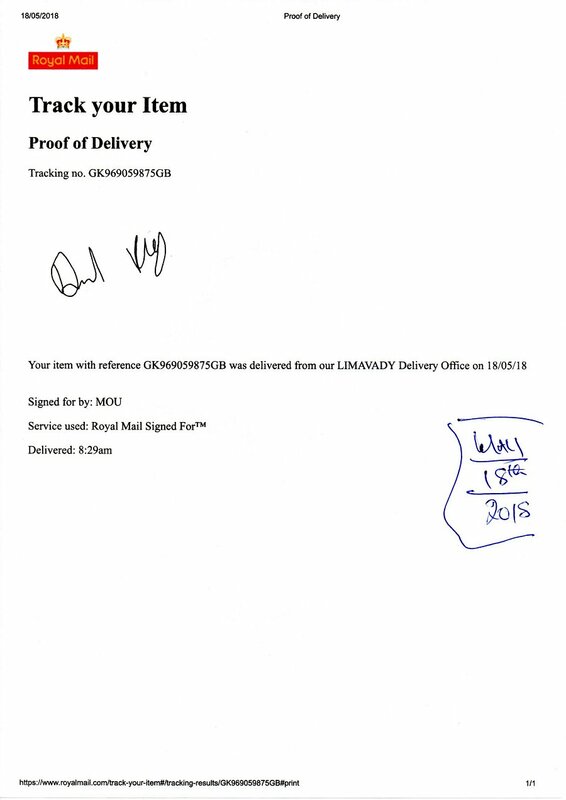 b) Visa Account: £******. Please see Statement #2 attached. 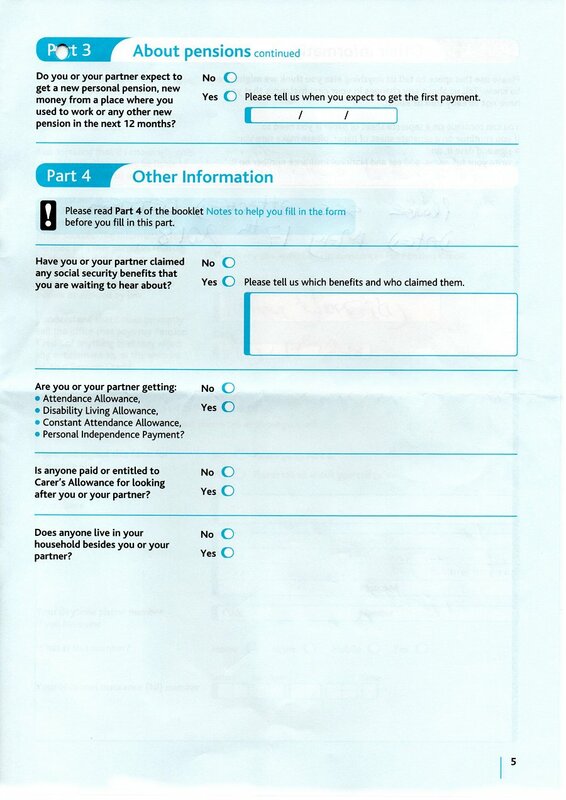 c) ISA Account: £******. 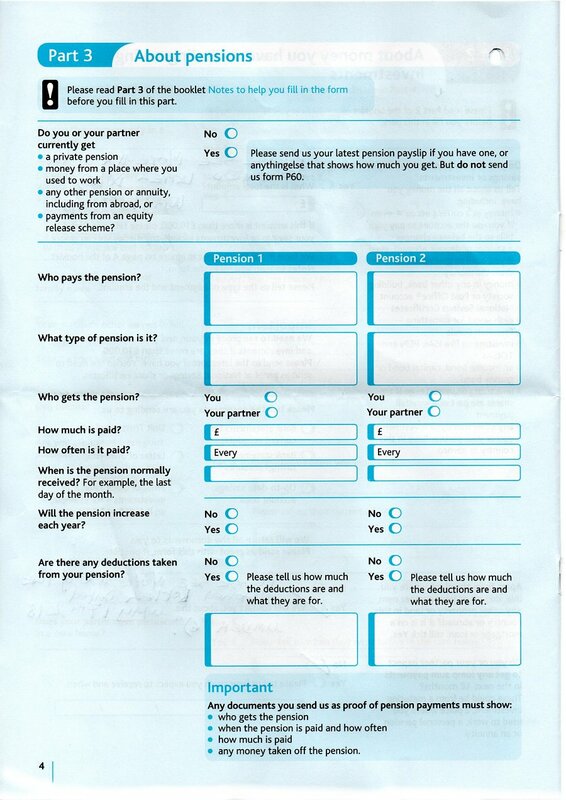 Lump-sum pension payment plus £**** interest. Please see Statement #3 attached. 2) AIB Bank, Dunlo St, Ballinasloe, County Galway, Republic of Ireland. Euro Current Account: €********. Please see Statement #4 attached. 3) Bank of Ireland, Main Street, Ballinasloe, County Galway, H53 A9N9. Euro Current Account (Number 2399859): €*******. Please see Statement #5 attached. 4) Ulster Bank, 365/369 Ormeau Road, Belfast, BT7 3GP. Current Account: £**. Please see Statement #6 attached. 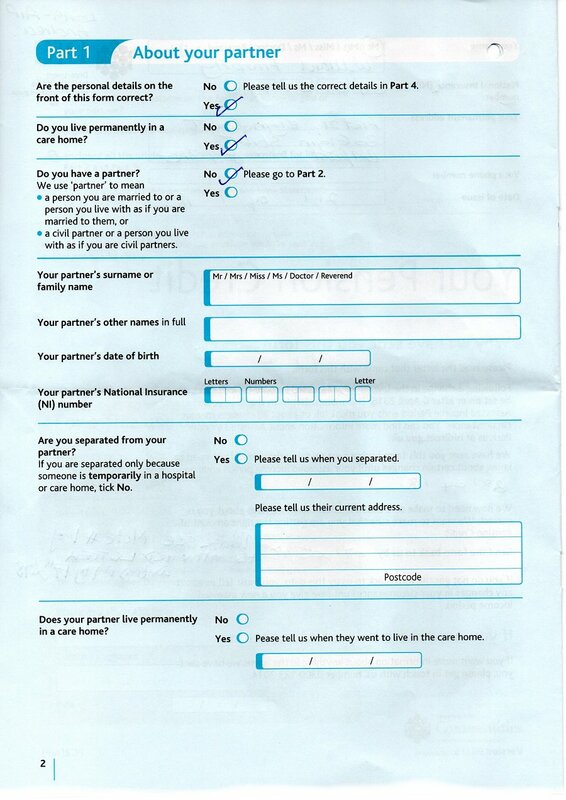 5) AIB, 3rd Floor, 1 Adelaide Road, Dublin 2, Republic of Ireland. Fixed Deposit Sterling Account: £*******. Please see Statement #7 attached. 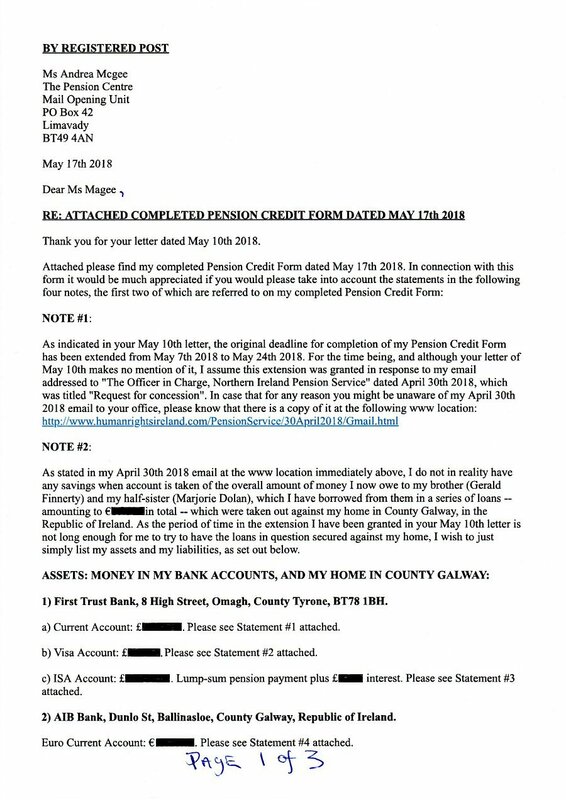 As referred to in my email to your office dated April 30th 2018 (referred to above), the above sum of €90,600 has been borrowed by me, over the past 11 years or so, through the use of a series of unsecured loans. 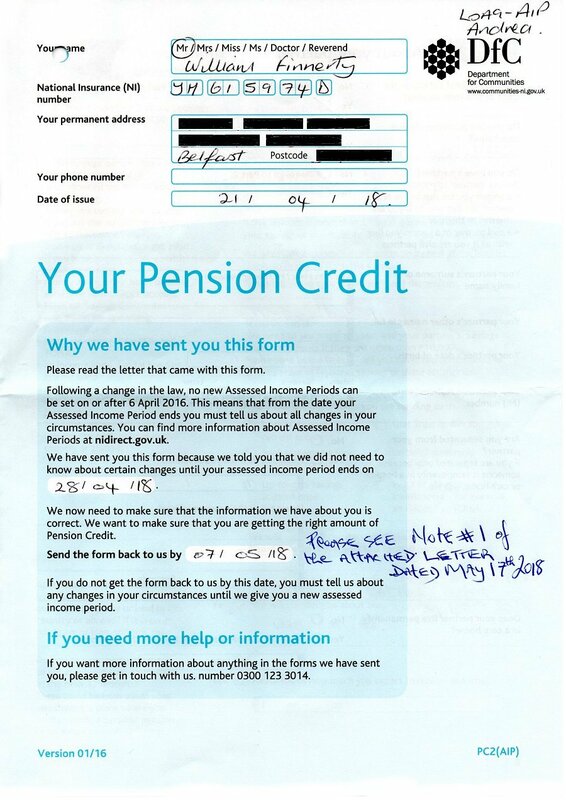 I now feel I should have another try at having these loans secured, in the belief that if I can succeed in having them secured against my home in County Galway, they will not be treated as savings (of mine) by your office, and by some other Northern Ireland Government Offices, such as the Housing Executive for example: which is how I understand they have been treated in the past, and up to the present time. 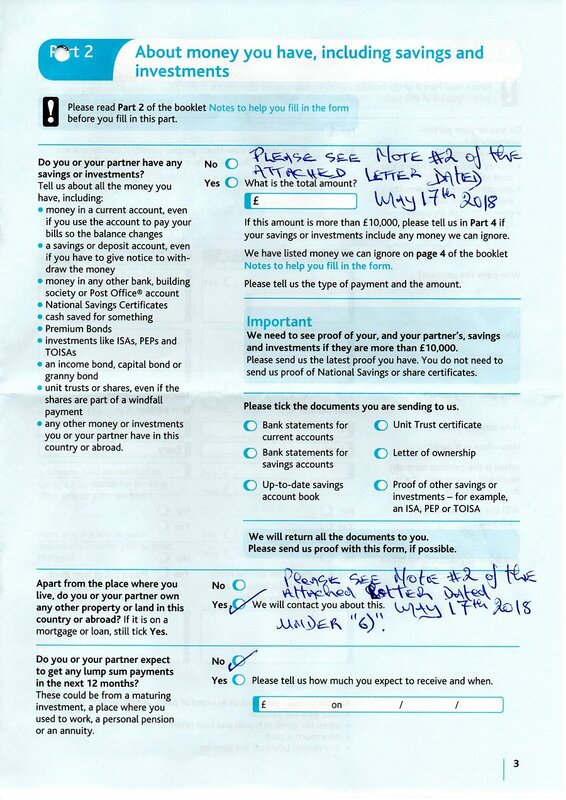 I would greatly appreciate it if you could please advice me on this matter of I thinking about "securing the loans" against my home, which I need to repay to my brother and half-sister, as outlined in the paragraph just above. Assuming an exchange rate of 87 pence Sterling for each Euro, it can be seen from the above figures that my liabilities exceed my assets by approximately £******. 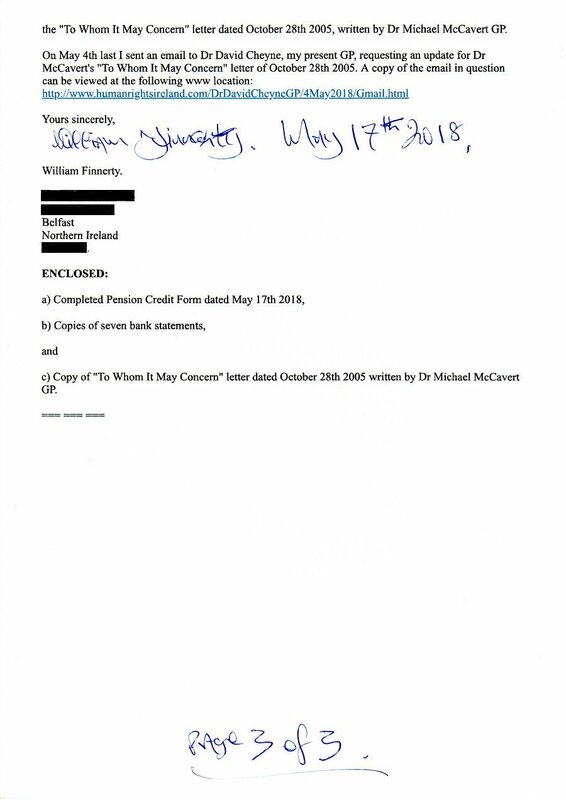 Finally, I feel I should point out that I am still suffering from the chronic PTSD / C-PTSD (Post Traumatic Stress Disorder / Complex-Post Traumatic Stress Disorder) referred to in the attached copy of the "To Whom It May Concern" letter dated October 28th 2005, written by Dr Michael McCavert GP. 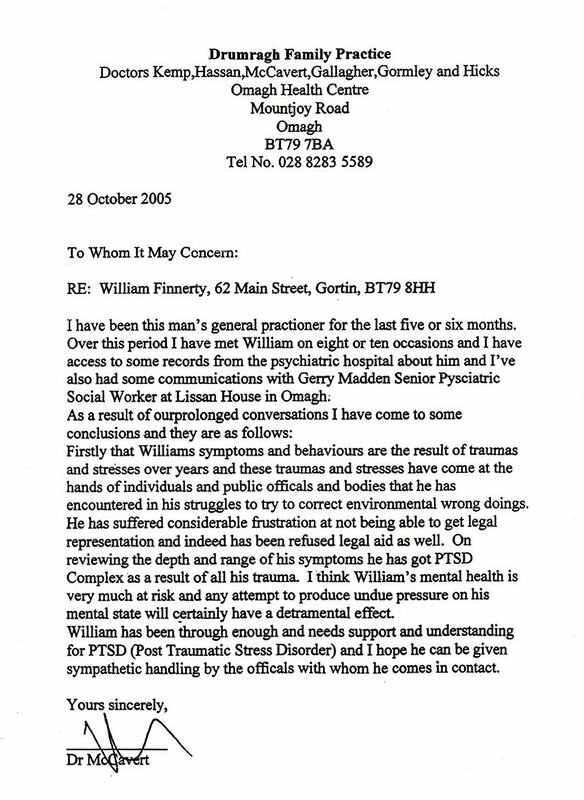 c) Copy of "To Whom It May Concern" letter dated October 28th 2005 written by Dr Michael McCavert GP.